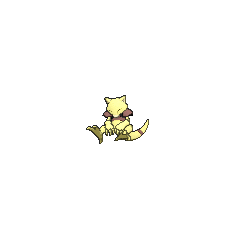 Abra in game: 3,362 Who? Important notice! Pokemon Abra is a fictional character of humans. 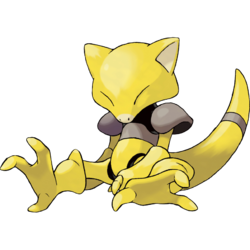 Abra is a bipedal Pokémon that is primarily yellow. Its face is kite-shaped, with a small, pale yellow snout and two short, pointed ears with pale yellow interiors. Its wide eyes are normally closed. 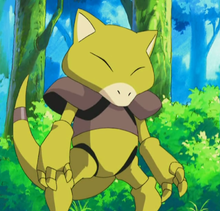 Abra's body is segmented with black skin is visible between its joints and along its neck. It has two brown, pauldron-shaped extensions on its shoulders, as well as a brown, fauld-like piece around its chest. It has three fingers and toes, with its fingers considerably shorter than its toes. Its tail is thick and long, with a brown band located near the tip. Abra can sense danger by reading minds. When it does, it teleports itself to a safe location so quickly that it composes the illusion of having made copies of itself. 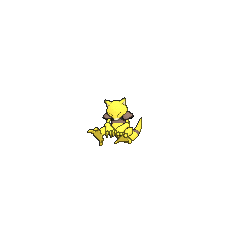 By hypnotizing itself, Abra is able to teleport or use any of its other extrasensory abilities at any time. Due to the strain of its telepathic powers, however, Abra sleeps 18 hours each day. If it fails to rest long enough, it will become unable to use its powers. Abra lives in urban areas, but has been observed to teleport to a different location once per hour. In The Psychic Sidekicks!, one of the citizens of Len Town, Mrs. Bellows owned an Abra which kept teleporting itself onto other people's heads. 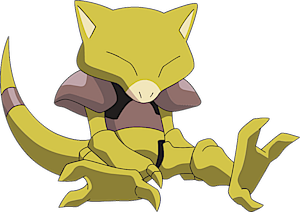 In Fear Factor Phony, an Abra was among the group of Psychic Pokémon living in an abandoned mining town. The little Psi Pokémon was asleep the whole episode in a sound-proof force-field. An Abra appeared under the ownership Mira in Sandshrew's Locker!. An Abra briefly appeared in Lights, Camera, Quack-tion. An Abra was one of Lucy's pets. A Trainer's Abra appeared in A Marathon Rivalry! participating in the Pokéathlon held in Camellia Town. 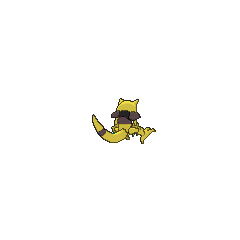 An Abra appeared as a mask for the festival in Capacia Island UFO!. Two Abra appeared in Cloudy Fate, Bright Future!, under the ownership of a pair of Psychics. A Trainer's Abra appeared in SM006. An Abra was seen in a Poké Ball at Oak's Laboratory in Cherrygrove in Off Course with Corsola. 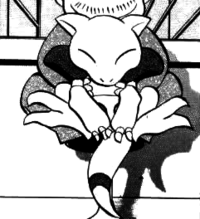 Green is seen to have an Abra as of Volume 13, using its Teleport attack to transport Silver away to a safer location. The boy was able to take this opportunity to seize a Flower Mail from the Pokémon with his Sneasel though, and appear in Ilex Forest to participate in the last battle with the Masked Man. 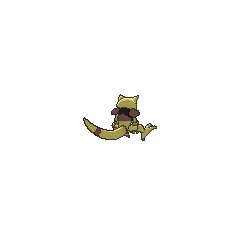 An Abra was one of the Pokémon sent to help the fight in Ilex Forest in The Last Battle XIII. Saturn also has an Abra that he used against Paka and Uji, but after putting up a tough fight, lost along with his Croagunk. If it decides to teleport randomly, it composes the illusion that it has composed copies of itself. If it decides to teleport randomly, it evokes the illusion that it has composed copies of itself.